I started my art career at Newcastle Art College, then I went into display and sign writing for a few years. After 3 children, I changed direction, and began a career within sales and business development which spanned over 20 years and my art was put on the back burner. It was only 2 years ago that I gave up the stressful life of business and decided to take up painting again, mainly spurred on by my mother who was a fabulous artist, and she, like me, gave up painting to work in a different direction to support her family and really regretted not pursuing her art. I absolutely love this way of life and within just a few months of taking up art again, my work was exhibited in a couple of galleries and I began to sell my paintings. In fact, my first painting "Madly Deeply" sold to a famous couple in Beverly Hills. My style is big, bold, and emotive. I like to be as realistic as I feel it needs, with an illustrative slant. I'm not too keen on backgrounds that a depict a scene or tell a story, as I feel it distracts from the subject. I like a good composition with a modern approach. I am often browsing through fine art photography and sometimes a photograph will inspire me. I love ballet pictures - this one was from a German photographer. I asked her if it was okay to adapt her picture and paint it, and she agreed. In the "Final Rehearsal" I wanted to capture the discipline of the dancers and their strength and beauty, but also add character. 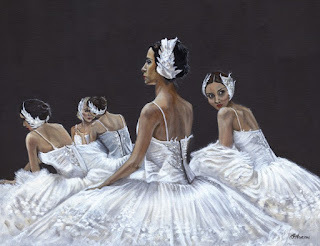 The painting is quite bold and shows the tension and characters of the dancers before going on stage. 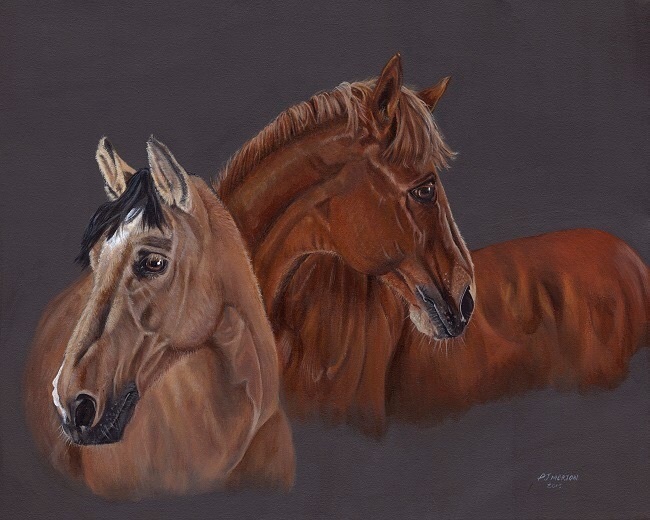 I absolutely love painting horses and capturing their strength and beauty, particularly their bone structure, and I wanted to portray these elements in this painting. Using acrylic paint, I feel I can add texture and reflect light and also build up layers to illustrate the physical form of these creatures. I still feel I have a lot to learn and would love to develop my style further. I am always looking at other artists' work for inspiration and techniques. My dream is to become noticed by my style and hopefully be in a position to sell my work in other countries. Recently I was contacted by American Art Awards Online to enter their completion which is open to artists across the world. The paintings were voted for by the top 25 Art Galleries in America. I am delighted to say that I won 3rd and 6th place in Human Form and 6th place in Animal Impressionism.